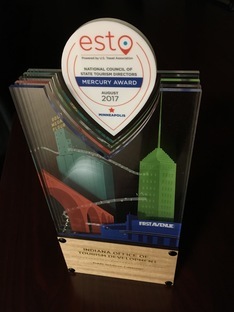 INDIANAPOLIS (September 5, 2017) – The U.S. Travel Association announced the recipients of its 2017 Mercury Awards during the 34th annual ESTO conference, held in Minneapolis and the Indiana Office of Tourism Development (IOTD) was awarded best Public Relations Campaign for the Indiana Bicentennial Torch Relay. IOTD is also being honored by the Indiana Historical Society for the Bicentennial Torch Relay. It was chosen as one of the winners in the Outstanding Bicentennial Collaborative Project category. A ceremony will be held in November. The Indiana Bicentennial Torch Relay, developed by IOTD, was one of the major commemorative events of the 2016 Bicentennial celebration. It was designed to inspire and unify Hoosiers by symbolically “passing the torch” connecting generations to ignite our future. The 37-day relay traveled more than 3,200 miles through all 92 Indiana counties. During the five week relay, undergraduate and graduate students from Ball State University worked with IOTD to produce daily videos, photos, articles, and social media related to the relay. A second team operated out of Muncie and produced a 37-minute documentary titled, “Everlasting Light: The Story of Indiana’s Bicentennial Torch Relay.” Ball State students have received twelve awards for their work on the project. You can purchase a DVD of the documentary here.